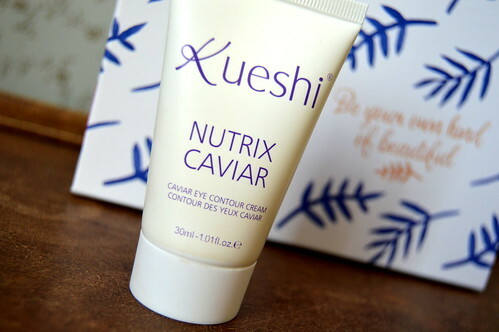 Today a review about the Kueshi Nutrix Caviar Eye Contour Cream. This product was also in the Deauty-box I bought a couple of months ago and I have been testing it out for a couple of months now, so time to fill you in on what I think about it! First of all I want to link to the post about the Deauty-box from a couple of months ago… In this post you can read all about Deauty and also which products I could find in the box. 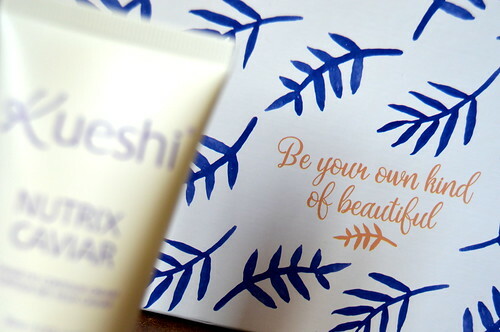 And now over to this Eye Contour Cream from Kueshi… a brand I had never heard of before… so let’s find out a bit about it! Price: you pay only 31,95 EUR for a 50 ml jar (the 30 ml tube I found in my Deauty-box apparantly isn’t available anymore), which will take you months and months to empty!! I have been using this eye cream twice a day for about 6 weeks now and the skin around my eyes definitely feels tighter! The cream has a medium consistency, which I like: not too light so you can actually feel that you are smearing something, not too thick so it doesn’t feel too rich and greasy on the skin. Because of the medium consistency, it is a good eye cream to use in the mornings as well as at night. The skin around my eyes feel hydrated and nourished. You could buy this brand at some beauty salons, but otherwise it’s only available online as far as I know! I’ve got this eye cream in a tube, but if you want to order it now, it comes in a jar, which is, in my opinion less hygienic, especially since it is a 50 ml jar which will take you many months to empty. Make sure to use a little spatula instead of your fingers! This is a very good eye cream at a competitive price. When my tube is finally empty, I might buy this product again! Here you can read another post about an eye cream. 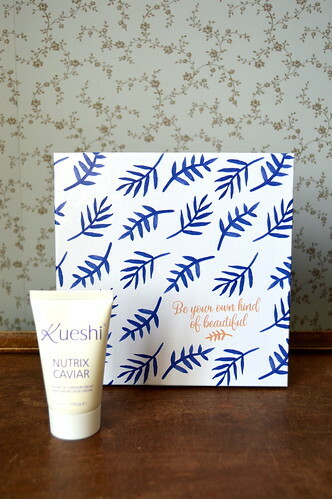 This entry was posted in Beauty, Skincare and tagged beauty, deauty, eye cream, kueshi, skincare. How to occupy yourself… after surgery!